Insights: Who is sending the guns to Nigeria? As Nigerians were on the street protesting over fuel subsidy removal, a British based man was being arraigned in UK over the shipping of 80,000 rifles and pistols and 32 million rounds of ammunition to Nigeria. The shipment included 40,000 AK47 assault rifles, 30,000 rifles and 10,000 9mm pistols. According to a report by the BBC, the man whose name is Gary Hyde, shipped these huge arm cache without receiving permission from the relevant government department in the UK. Gary Hyde was not alone in this deal. It was carried out with his business partner Karl Kleber, a German national based in Germany, the court was told. The pair acted as middle men between two Polish companies acting for the Nigerian buyers and Chinese companies, the court heard, according to the BBC report. Both men received commission payments for the deals totalling around $1.3m (£840,000) or N351 million. The story apparently left several questions unanswered. Who were the Nigerian buyers? 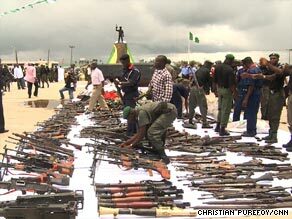 Were these guns really delivered to Nigeria eventually? It is also interesting that since this story broke out in the British media, the Nigerian government has not come out with any specific statement on it. Were these weapons imported by the Nigerian government? If they were not imported by the Nigerian government, have they made any efforts to trace the importers of these large numbers of weapons into the country? Thirty two million rounds of ammunition are enough to kill thirty two million Nigerians, assuming each bullet will kill a Nigerian? This may be an exaggeration, but there is no doubt that if there is this amount of guns and ammunition out there outside the control of the government, then every Nigerian has a serious course to be worried at this time. 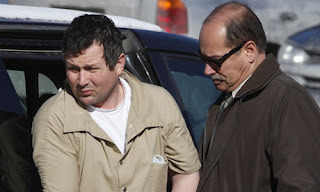 The Observer reports that US officials arrested Hyde in connection with the alleged illegal import into the US of almost 6,000 Chinese-produced AK-47 magazines, each capable of holding up to 75 rounds of ammunition. The Observer also quotes a Wiki leaks release of confidential US embassy cables which shows that in 2008 York Guns, where Gary Hyde is a director, tried to ship 130,000 of the assault rifles to Libya. The WikiLeaks revelation shows that Gary Hyde through his company acted as an intermediary between an unidentified Ukrainian arms manufacturer and Libyan officials. “The size of the deal raised eyebrows in diplomatic circles, as Libya has only 70,000 ground-force troops and these would be unlikely to use a weapon as dated as the AK-47. 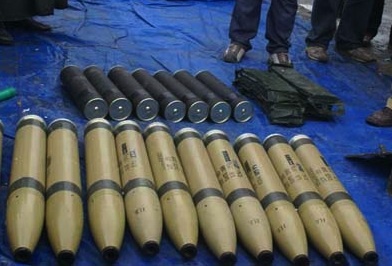 The cable noted that the export licence was rejected because the "UK is concerned that the intention may be to re-export the weapons, particularly to armed rebel factions backed by Khartoum and/or Ndjamena in the Chad/Sudan conflict". What emerges from these reports is that the two men now being named in connection with supply of arms to Nigeria should raise serious concerns in Nigeria. Have they supplied some other arms into the country, that the authorities are not aware? The concern becomes even more real considering the fact that at the same time Gary Hyde was being arraigned in UK, the Ghanaian authorities intercepted a truck loaded with arms and ammunitions heading to Nigeria. The ammunitions included pump action rifles and live rounds. These arrests are coming at time the Boko Haram insurgence is getting worse in Northern Nigeria as bombs explode on almost on daily basis and masked men go on killing spree with sophisticated weapons. The activities of Boko Haram, the continuous crisis in Jos is no doubt raising serious concerns and fears of retaliation from other ethnic groups. 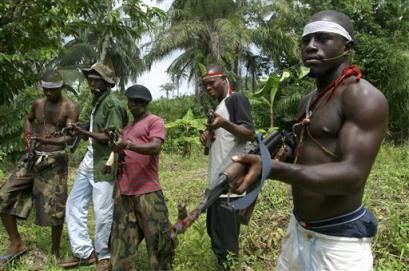 Could this inflow of arms be linked to ethnic groups arming themselves? Are they arming themselves to defend themselves or to go on the offensive? This is a critical period in Nigeria’s history and all people of goodwill must stand up and douse the rising intention. As I said in my earlier post, the Rwanda trip will be a dangerous place for Nigeria to go. The government must also act and act fast. This is also the time the international community must come to the aid of Nigeria. It is clear that the Nigeria intelligence agencies do not have the capacity to deal with the emerging challenge. They must offer their help at this time. They cannot wait for a Rwandan type crisis to develop before they intervene. China, especially, should caution its business community. This is not the time to fuel the crisis in Nigeria for monetary gains. Nigeria is China’s biggest market in Africa. An unstable Nigeria will not be good for China’s long term economic interest. All pictures sourced through google images. THIS IS A GREAT BLOG WITH THE LATEST INFORMATION. I WOULD HAVE MISSED A LOT ONLY IF I DIDN'T TAKE MY TIME TO READ THIS POST ALL. A useful article spoilt by an unnecessary attack on China. Is it China or the US, Germany and Britain funnelling arms into Nigeria (and other parts of Africa)? How do you go from this piece about British and German arms dealers and warlords to accusing China of 'fueling the crisis for monetary gain'? A very poor typically middle class response. To begin with, this piece is an eye opener and also shades more light on the 'men behind the mask' on the Nigerian present security challenges. Nigerian government should investigate this properly without leavin any stone un-turn. However, the piece was very biased to the Chinise. The Beijing government has no reason to fuel sectarian violence in Nigeria, this is because of the fact that she stand to gain more by Nigerian security. Don't forget this, Nigeria is the largest Chinise market in Africa. Nice piece but very biased towards the end. Those complaining about "unnecessary bias against China" either did not understand the link to China as pointed out in the article or chose not to read the article properly - the weapons were sourced from China as clearly pointed out in the article! According to my research, Nigeria is becoming the biggest importer of Guns. Well, who will let China know? Harper?